We’re looking at a highly unique slot machine today. Fruit Warp showcases Thunderkick’s creative streak excellently with the developers experimenting with new gameboard designs and how these interact with special features. The game comprises of a total of zero win lines, no “wilds”, and no “scatter” symbols. It’s played over a board that features no rows and no reels. If you’re a well-seasoned slot player, such a description probably has you suitably intrigued to find out more about this title. Let’s do just that then! Highly creative take on the slot machine format. We’ve never seen a slot that just throws out random symbols with no effort to resemble a classic fruit machine before! Nice art style. Although incredibly basic, the artwork does all that is required of it. There’s nothing overly fancy but the symbols look bright and vibrant and there’s no mistaking which fruit each one is supposed to be. Not all players will enjoy this radically new take on slot machine design. Some folks fear change! Since the Fruit Warp slot machine is so creative in its design, the way top jackpots are awarded is also sort of novel. 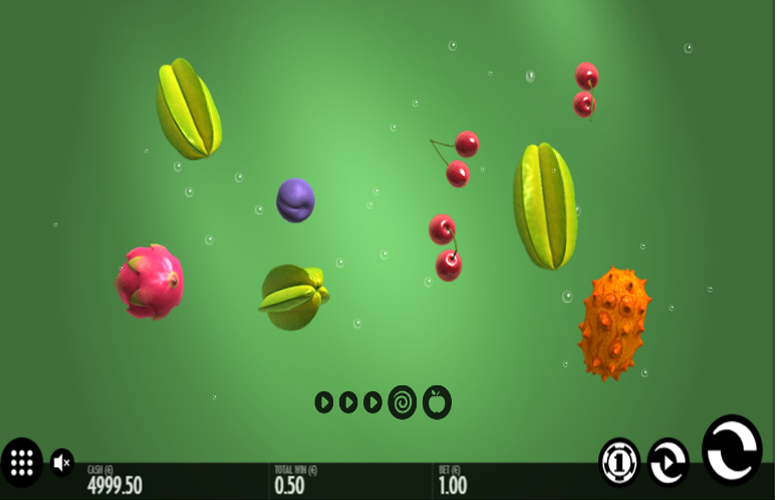 Rather than spinning reels, the game instead throws out nine random pieces of fruit. The goal is to match as many as possible up to a total of nine. We must congratulate Thunderkick for being daring in their choice of symbols too with some distinctly modern and exotic fruits joining the standard line up of casino favourites. 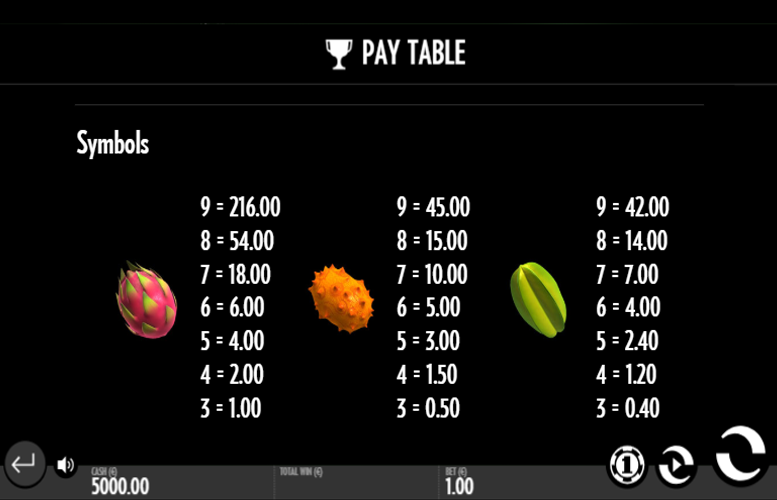 Dragon fruit = 216x the total bet. Horned melon = 45x the total bet. Watermelon = 42x the total bet. Grapes = 36x the total bet. Banana = 30x the total bet. Orange = 27x the total bet. Strawberry = 24x the total bet. Plum = 18x the total bet. Cherries = 15x the total bet. We’ve decided to group all the symbols together above instead of dividing them into higher and lower prized symbols. This made sense since the gameplay of Fruit Warp is so different to that of many slots we’ve played. There is also no tier differentiation between the fruits anyway. 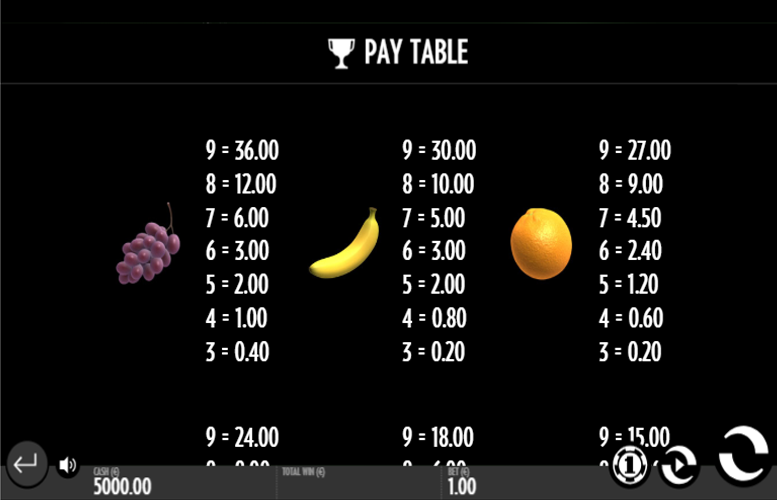 Rather than relying on “ways to win” or win lines, the Fruit Warp slot machine instead requires players to match three or more symbols amongst the nine random pieces of fruit that are thrown out onto the main game screen. Landing four symbols of the same type on a spin will grant a partial re-spin of the non-matching symbols. 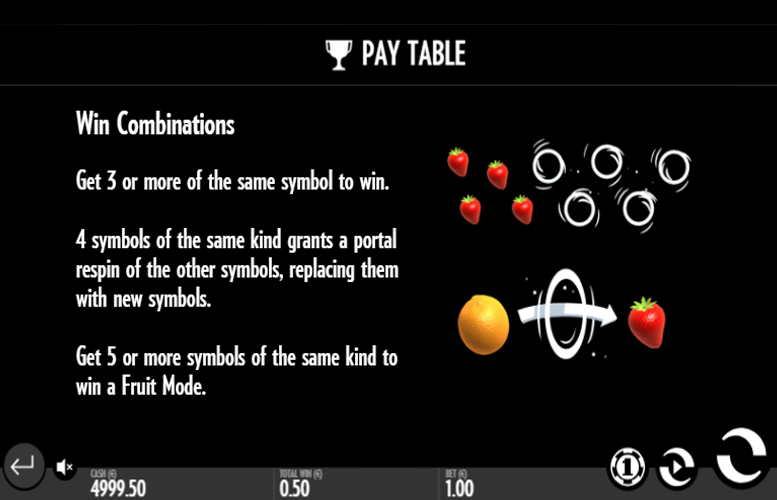 Landing five or more of the same symbols will win a “Fruit Mode”. Each symbol matching the “Fruit Mode” type will activate one step in the Warp Meter. Some steps contain dynamic multipliers and extra lives. 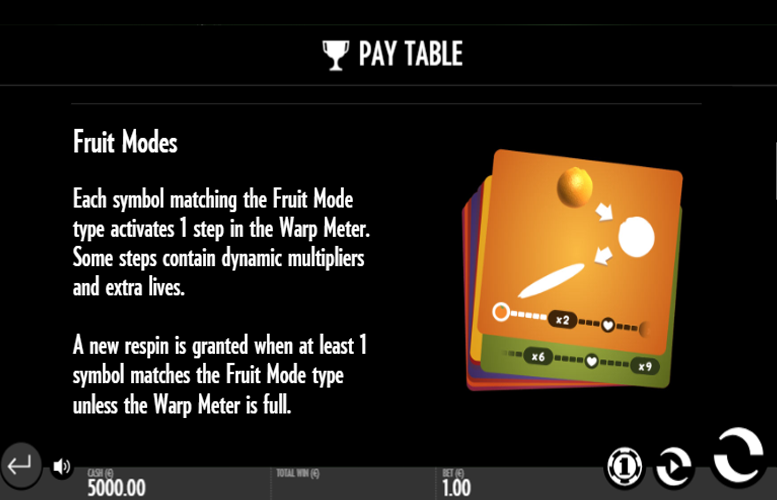 A new re-spin is awarded each time at least one symbol matches the “Fruit Mode” type unless the Warp Meter is full. The dynamic multipliers will increase in value for each win until they are activated, and their value is locked. The number of symbols in a win determines the multiplier increment, distributed from right to left as evenly as possible. An activated extra life will award one extra re-spin if no symbol matches the “Fruit Mode” type. Players should note, however: Extra lives spent do not grant step increases. As usual on Thunderkick games, players do not have options to adjust either the number of win lines played (there are none anyway) or the amount bet on each line. Instead, they are simply presented with a list of 12 different total bet amounts. These range from just 10p right up to £100. Although not the largest upper betting limit ever, we’re confident that all but the highest rollers around will find the maximum bets on Fruit Warp more than enough. The Fruit Warp slot machine from Thunderkick is a great example of iGaming developers thinking outside the box. They’ve approached the title with fresh eyes and managed to create a unique game that’s immensely playable and really looks the part. We particularly liked the innovative take on bonus features, as well as the win line-less gameplay itself. Unless the radical design overhaul offends you, there isn’t a lot to hate about this machine. We recommend giving it a go. Fans of simplistic titles, as well as those who think they’ve seen it all before will likely get a kick out of Fruit Warp. This game has a rating of 4 / 5 with 794 total reviews by the users.